Terri (Whoopi Goldberg) is a drone in the data processing cattle pen of a large international bank. Her cheeky attitude stands in the way of her promotion despite her popularity with the rest of the team and her super-human proficiency with computer technology. And then suddenly, one night, she discovers that a British spy has been monitoring her online chit-chat and, as he thinks she is a man, is asked to help get him the exit strategy needed to rescue him from the cold. Jumpin' Jack Flash is a fast, funny take on the classic civilian-rescuing-a-spy movie. Terri is idiosyncratic on her best days, but drug her and put her in the way of spies, counter-spies and British dignitaries and it's bare-faced comedy. 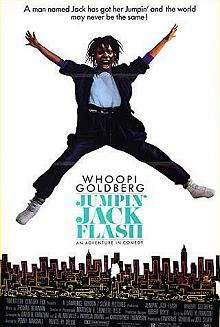 Well-written, with a comedy that is carried on an incredible tale of computer-based espionage, ably and enthusiastically performed, Jumpin' Jack Flash is an excellent example of what can be done by a strong writing team and a strong cast.